Frenchman, you ask? Yes, Flamini. I think he heard me say he should not be allowed to shoot last week, because in the 8th minute, he shot it straight at Viviano, it rebounded, and he shot it again and it actually went in, not over the bar and into the cheap seats like usual. And he picked the perfect day to score, too, as Berlusconi was watching in the stands. Will he be the new favorite? Other than that, it was a battle in the trenches. Bologna amassed 20 fouls, 4 yellow cards, and a red card. Milan did some damage, too, with 12 fouls and a yellow card. I was nervous for a couple of our players out there - Nesta, just coming back from injury and seemingly fairly tired, and Cassano, who seemed to be the target for a lot of back slapping and shoving, and it seemed to take its toll. Fouls aside, Ambrosini looked pretty tired. He started out as the captain we know and love, but eventually faded into a shadow of his normal self. He had a sloppy foul in the 23rd on Di Vaio, and just seemed tired and a little careless all the way around. Boateng brings so much energy, but today it didn’t seem focused. It was kind of like the Brescia game last week, where he just wasn’t himself. His shots were wild (much more so than usual) and he didn’t seem 100% effective offensively or defensively. It doesn’t help that he earned himself a yellow card in the 63rd, and was subbed off in the 81st for Pirlo. Speaking of Pirlo, he came on with a vengeance, maybe trying to show match fitness and/or earn a new contract. Granted it was only for about 12 minutes, but it reminded me of the good old days, and I hope to see how much longer he can sustain that level of play in the next 3 matches. I love Seedorf, but being knighted this week seems to have been too heavy a burden to carry at a reasonable speed. He had a few nice plays, but there was once when he got the ball in the box and just held it instead of clearing it quickly, and I felt like I was a parent at a kids’ game, screaming at him to clear the ball. It was Slowdorf to the extreme, and I don’t like slow, Sir Clarence. Bring back the feisty Seedorf that wowed us with his awesome turns, passes, and even goals, please!! Our defense was pretty sturdy. Abate wore his turbo cleats today, he had some fantastic crosses again, if only there were someone available who could shoot the ball. He was a beast all the way around, and once again, he and Abbiati get my running MOTM honors. (Except for that hair - did he go to Boateng’s stylist or something? Not good.) Nesta did well enough just coming back, Silva made up for any slack Nesta left, and Zambrotta.,.. I think I need to see a birth certificate, because he is playing so much younger than he is. He got forward a lot today, took some nasty fouls, ran the ball down, I was very impressed. Now for our “forwards.” The most amazing thing about Milan being in 1st place is how many games we have played with forwards who just can’t finish. 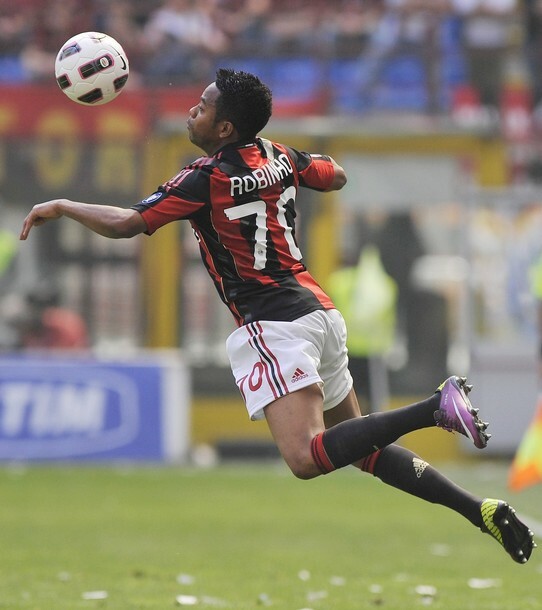 Specifically, I have to call out Robinho. in the 61st , he was 1 v 1 with Viviano, basically running on to an open goal. And it was a classic Robinho miss, I’m pretty sure my grandma could have made that one, although to be fair, she wouldn’t have been running so fast. Although I do have to give him that between Viviano’s new mustache (NOT good) and that baby blue satin kit, (what WAS he thinking?) it might have proved distracting enough… unless we hadn’t seen this a hundred times before. Cassano had a nice turn & shoot in the 17th, but it took that pesky keeper AND a defender to keep it out. He seemed to work hard, but seemed marked more than the others - maybe they just knew they could catch him and not Robinho? Either way, Boateng did not excel in the CAM role as he has in the past, and that meant fewer opportunities as far as shots. We had 9 shots in all, 4 on goal, and we were able to keep Bologna to 4 shots, with only 1 on goal. Most of those shots came in the last 15-20 minutes, when our fatigue was really starting to show. We were rewarded by Bologna not being able to keep up the intensity and pace with which they started the match, and by a ref who got things right in a pretty physical game. But we got very lucky when they went down to 10 men right as we were losing our pace, our possession, and our stamina. They had been taking some very dangerous shots when Della Roca came in hard with a nasty tackle on Nesta and was red carded for his efforts, and they didn’t get the looks on goal they had been after that. One very refreshing thing was Allegri’s choice to sub in our Primavera striker, Beretta in the 87th for the tired punching bag called Cassano. in the 7-8 minutes he had on the pitch, he got forward for a couple of chances, and Pirlo linked up nicely with him, too. With a few more minutes playing time, I am convinced the kid could have scored, and I would love to see Allegri make a habit of giving more time to some of our youngsters now and next season. The fans were fabulous, they truly lived up to their 12th man status. I know we are getting excited about the Scudetto, and it is so close we can taste it, but in a match like today, where our troops went into the trenches, their part was even more important than usual. Plus, they were rewarded by the French Connection, a rare goal by our own Flamini. Three points closer. Merci, Flamini!